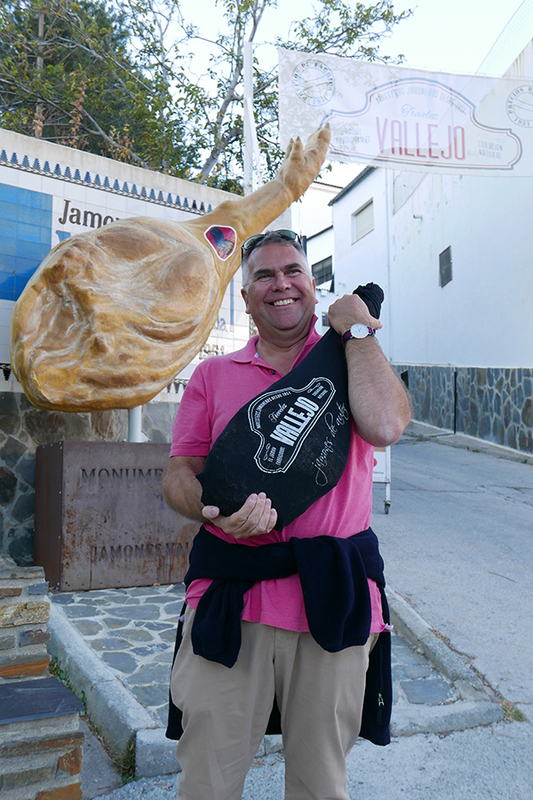 OK, that may not sound that thrilling, but we bought a whole jamón from the village where it is cured and air-dried, and we bought the jamonero to go with it, along with knife and sharpening steel - we’re suckers for a bit of artesania. 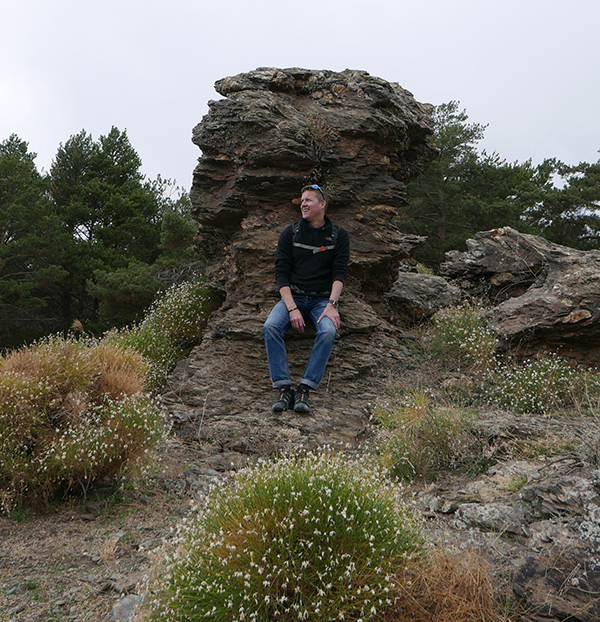 We actually went to Trevélez for a walk, having enjoyed our last sojourn into La Alpujarra so much. Trevélez is the second highest municipality in the whole of mainland Spain, and it lies within walking distance of the highest peaks in the Sierra Nevada. I use the words ‘walking distance’ advisedly, as the walk would be fairly challenging, I feel, and one we may tackle once we have gained plenty of experience elsewhere. The drive to this mountain village is worthy of all the superlatives you can muster. It becomes difficult, writing these blogs, to describe adequately the sheer majesty of the landscapes and the diversity of every corner of the route. Instead of driving on the north side of the Guadalfeo valley, as we have done previously, we took the southern route that leads towards Torvizcón. As soon as you drive off the motorway, you find yourself on a road surrounded by sheer natural beauty around every bend. Rich, golden craggy cliffs are punctuated by the lush green of abundant pine trees and the valley below is a thick network of agricultural produce through which flows the Rio Guadalfeo. 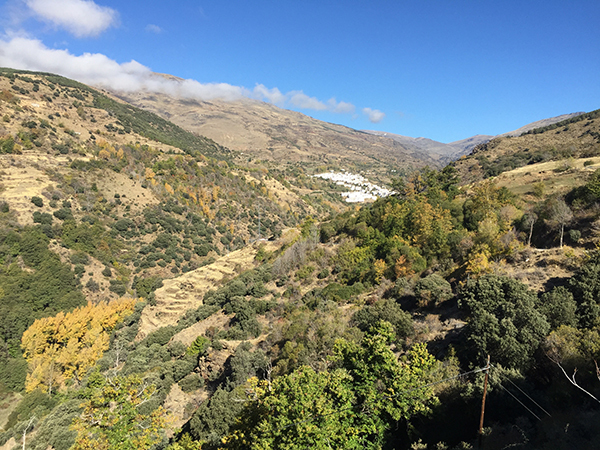 Torvizcón looked a pretty place as we drove through it; the main road literally touches the edge of the village before continuing on into La Alpujarra. It is certainly a place that we’d like to explore, but it was not on the agenda today. As we drilled deeper into the valley, place names that have become synonymous with authors such as Chris Stewart and Gerald Brenan (author of South from Granada) started to crop up, and it becomes clear why this has been such an attractive area for so many travellers over the years. Once the road crosses the river, it starts to climb steeply up into the mountains, and every bend affords ever-widening views. On this road, you are reminded just how large a stretch of mountainous terrain makes up the Sierra Nevada and the Alpujarras region. It is almost impossible to appreciate the scale when the range is viewed from afar. The landscape through which this narrow road climbs is simply beautiful, and autumn brings out a huge array of colours, from the dark pastel greens of the Holm Oaks to the burnt yellow of the poplars, and the russets of cherry trees and grapevine. The higher we drove, the atmosphere changed and it became far more alpine in both the mood and the temperature, but no less spectacular. We seemed to go a wide way around one side of the Trevélez valley, but eventually we rounded a bend to see a scurry of white-washed buildings hugging the upper reaches of the valley, just beneath the dominant form of the Mulhacen peak. Seeing these villages for the first time, you wonder what on earth possessed people to make their home here many hundreds of years ago, when life must have been extreme to say the least. 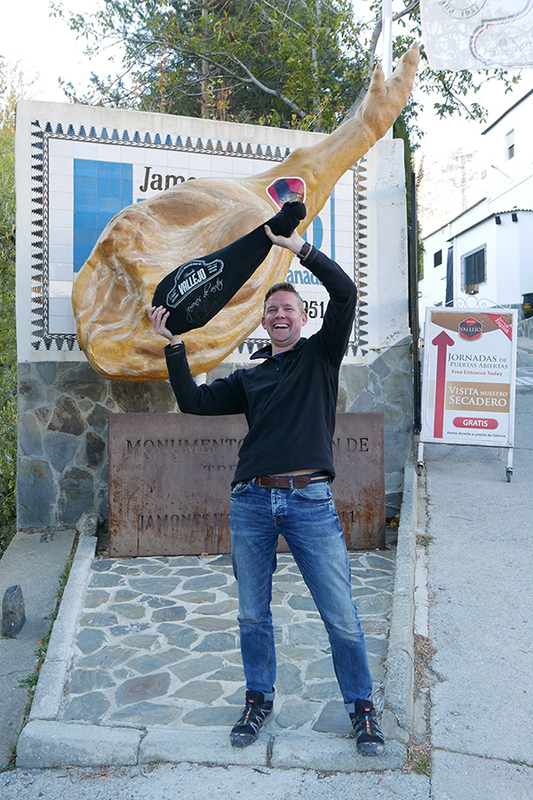 Although La Alpujarra, as a region, is renowned for its jamón, Trevélez wears the crown. Its climate is perfect for the storage of haunches of cured pork as they mature, having first been stacked in piles of seasalt from the nearby Cabo de Gata or Torrevieja. Various curers line the streets of this otherwise very traditional white village, and inside their humble buildings row upon row of hams hang from ceilings in cool rooms, drying slowly in the mountain air. 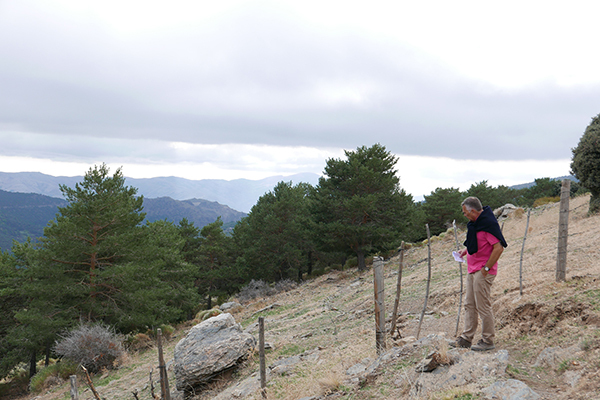 We wanted to take a walk from the village, along part of the GR7 route that runs from here to neighbouring Busquistar. Time prevented us from doing the full route of 12.5 kms, but we will return as this is purported to be one of the prettiest stretches of the GR7 hiking trail. That said, the section we did take was yet another glorious walk with staggering views down the valley, or back up to the giant chunk of Mulhacen behind us. Holm Oak and pine lined most of the route, giving way frequently to allow us to see the sun-dappled hills on the opposite side of the valley, as clouds came and went. The weather changes rapidly in this range of mountains, and the area clearly has its own very particular microclimate. Any snow that was very much in evidence a day or so ago was barely noticeable today, and the temperature was certainly a few degrees warmer than it had been. 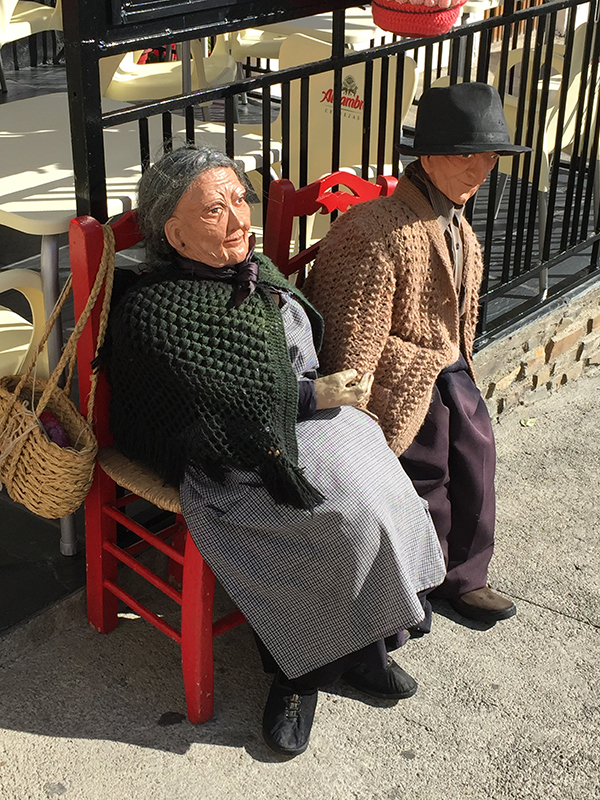 Whether we were fuelled by the beer we had at lunchtime, once we had returned to the village, I don’t know, but we felt compelled to visit as many of the jamón curers as was reasonable, picking up some delicious local cheese on the way. Prices for jamón are rather like those of fine wine, and range from the sensible to the slightly scary depending on the curing duration and weight. We couldn’t resist and came away with a large and heavy limb of pig in the boot of the car. 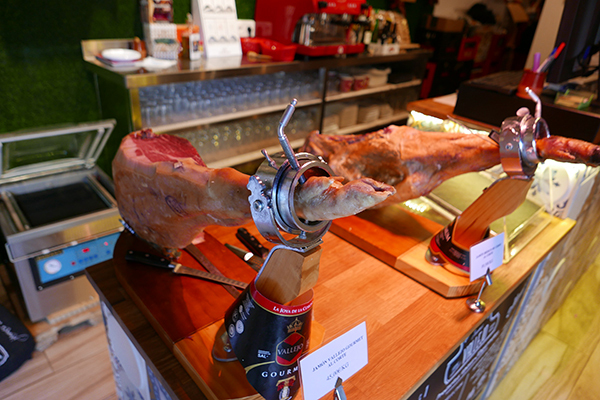 It seems that jamón will be on the menu for the foreseeable future.